Commentators in newspapers around the world have called for collective action to deal with the increasing attacks on shipping by Somali pirates, but disagree on how to tackle the problem and what responsibility the West should bear. One Saudi commentary suggested an Arab Islamic solution to the instability in Somalia, while another expressed concern about US and European talk of anti-piracy action in Arab waters. Kenyan commentators object to the use of their country as a "dumping ground" for pirates seized in the Indian Ocean and brought before Kenyan courts, saying piracy isn't a Kenyan problem. Piracy is no different from terrorism. It requires international measures led by the United Nations in order to guarantee the safety of navigation before pirates return us to the times when pirates ruled the seas. We worry about the new US and European talk about "the necessity to protect commercial ships in the Red Sea", the sea which is surrounded by Arab countries from all sides! The Somali pirates are threatening our national security. Why don't we try an Arab Islamic solution? Why don't the kingdom, Egypt and Yemen launch a political, cultural and developmental mission that targets Somalis. We would call for the immediate departure of the Ethiopian forces and deployment of Arab forces instead. Major powers now oversee everything that happens on planet earth via satellite. They don't lift a finger to stop this chaos in international waters, which forces countries overlooking the Red Sea to defend the freedom of navigation and put an end to piracy. A regional approach, without waiting for major powers, is required. Surely, Western countries could confront the pirates and eliminate them. However, it seems that despite their military presence, they do not want confrontation for their own reasons. This is why the region's countries must protect their coasts to prevent the region from turning into a haven for a new world struggle. It is difficult to believe that this is happening in the age of satellites, which makes it possible to see footage of an ant walking. It is also the age when smart missiles are launched from the Atlantic Ocean to accurately hit targets in the Indian Ocean. The world has been shocked by the action of Somali pirate gangsters who hijacked the Saudi tanker off the coast of Kenya. The seizure of the super-tanker Sirius Star shows the extraordinary fierceness of the Somali pirate gangsters and demonstrates the failure of the international community to protect the navigation route in the African region. Yesterday, eight suspects appeared before a Mombasa court charged with crimes relating to piracy in the Indian Ocean. These suspects were arrested by the British Army. We welcome action by European and American forces. But we do not want to be a dumping ground for Somali criminals. The world must develop a strategy on how to deal with Somali crime. 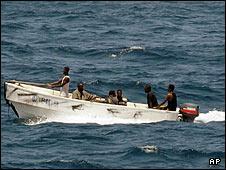 Eight Somali pirates were handed over by the Royal Navy. They had been arrested as they tried to hijack a ship near the Red Sea. What has this to do with Kenya? This happened in the territorial waters of Somalia or Yemen, not in Kenya. They cannot be tried here because they did not commit an offence here. Does Britain expect Kenya to incarcerate them permanently without trial? If so, it is simultaneously requesting Kenya to commit human rights abuses while criticizing it for not investigating other abuses. That is definitely hypocrisy. The seizure this week of a Saudi oil tanker by Somali pirates should serve as a wake-up call to the Somali crisis that has been neglected by the world for close to two decades. The solution to this crime lies in restoring an effective government in Somalia.